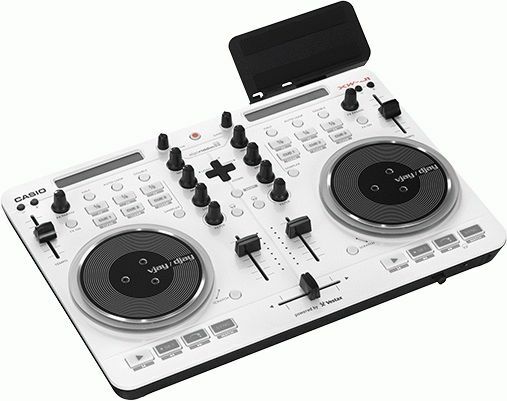 Casio’s XW-J1 DJ Controller won a prestigious product award in America last week, further enhancing the reputation of the innovative DJ unit. Casio America, Inc. announced that the XW-J1 DJ Controller had been named as an International CES Innovations 2015 Design and Engineering Awards Honoree for its XW-J1 DJ Controller within the “Portable Media Players and Accessories” product category. Products entered in this prestigious program are judged by a preeminent panel of independent industrial designers, engineers and members of the media to honour outstanding design and engineering in cutting edge consumer electronics products across 28 product categories. The XW-J1 is an all-in-one VJ / DJ controller for mixing music and videos using the djay app for iTunes and the vjay video mixing app from Algoriddim GmbH. Take advantage of state-of-the-art features to mix and DJ music or create video mashups using songs and videos from your device libraries. Record your mixes and save them to your iTunes library and remix videos and create soundtracks using songs from your library. The XW-J1 and djay give you instant access to all your existing songs and playlists on your Mac, iPad, iPhone and iPod Touch using the familiar iTunes library screen.